The first Japanese typewriter, the Nippon, was built in 1915. It held a large tray of characters that were individually selected and printed. In 1940 Toshiba produced another kind of index typewriter, featuring a large horizontal cylinder. This system remained in production until 1954. 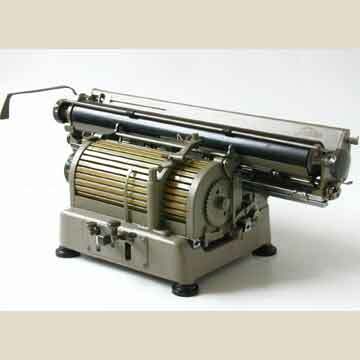 The first Toshiba typewriter, holding 630 characters in total, was mostly used by the Japanese military during World War II. In total about 2,000 units were produced. It is not known if any of these still exist. In 1946 Toshiba introduced a new model, the 1200 A, featuring 1172 Japanese and Chinese characters. Like the first model, this machine was built for B4 sized paper. Four years later a wide carriage version of the 1200 appeared, the 1200 AL, that could handle A2 sized paper. This wide-carriage version became a national success and was widely used by Japanese banks. The series ended in 1954 with the introduction of two new models, the 1400H and the 1400FL(presented here). The bulk of the machine consists of the type cylinder. Each horizontal strip shows a linear index of the characters that fitted on the type strip behind it. The character is selected by rotating the cylinder and shifting it horizontally, so that the necessary character is selected with the index pointer. When the print key is depressed, the type strip is pushed upwards from the cylinder, and the type hammer swings to the center to print the character onto the paper (pic 6). In 1955 Toshiba changed course and introduced 'western-style' keyboard typewriters that used the 48 Japanse Kana characters.